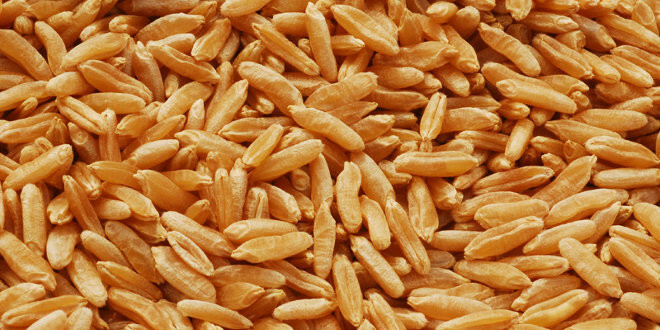 Home » Food » Kamut Or Khorasan Grain? Contrary to popular belief, Kamut® is not the name of a grain but rather a registered trademark of a variety of grain called “Khorasan”. This ancient grain was a staple in ancient Egypt. In 1948, Earl Dedman , an American air pilot stationed in Portugal , received 32 Khorasan wheat berries from a colleague who returned from an expedition to Egypt. Dedman hastened to send the precious grains to his father in Fort Benton in the United States. For many years, no one paid attention to the “Grains of the Pharaohs” as they used to called them. Until one day, Mack Quinn and his son Bob, two agronomists from Montana (USA) purchased the grains at a local flea market in Fort Benton. They were quick to realize the nutritional value of this grain. Khorasan contains 40% more protein than regular wheat and is rich in minerals such as selenium, magnesium and zinc as well as vitamin B, vitamin E and fatty acids. The quality of this grain is also very high, as it has never been cross-hybridized or modified. In 1977, Mack and Bob Quinn decided to cultivate this ancient grain. In 1990 they registered the protected cultivated Turanicum variety QK-77 as the trademark Kamut® and under that name the grain was introduced in the market of health food products. Today, Khorasan wheat is produced primarily in Montana (USA) and in Manitoba and Saskatchewan (Canada) under the strict control of the Quinn family. It is exported to Europe and other parts of the world. Its popularity has exploded and sales have been growing exponentially due to an unprecedented marketing strategy. The Kamut® brand of Khorasan wheat provides high energy to people with active lifestyles. Although high in protein, this grain is also high in gluten. It is more easily digested than other conventional varieties of wheat and generally well tolerated by individuals with wheat sensitivities. Because of its high content in gluten, it is not suitable for people with celiac disease. Khorasan flour is not refined and has a mild and sweet taste. Kamut® can be used in recipes that call for wheat flour, such as pasta, bread, cookies, crackers and any other baked goods.